Rockpalast , Gruggahalle Essen . Whoooo, what a week, something of a record for us Brit heads. The Dead at the Rainbow on the Saturday Sunday and Monday and the following weekend a repeat dose from Germany in the form of a simulcast. Dead heaven personified!!!!! 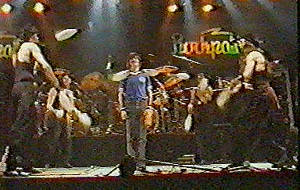 Having caught 3-21-81, I knew that the boys were firing on all cylinders and we accordingly made preparations to record the show . At the time I did not have an FM tuner, so I borrowed one from my neighbour Tony and we rigged up a jerry-built aerial from lots of wire which we strung across the wall and taped up until we got the best reception we could .Surprisingly it worked brilliantly. The reception was fantastic and the resulting recording was my first ever FM master . This whole simulcast was a marathon. For one thing ,as this was a direct broadcast and due to time differences, the show did not start until around 10 pm . 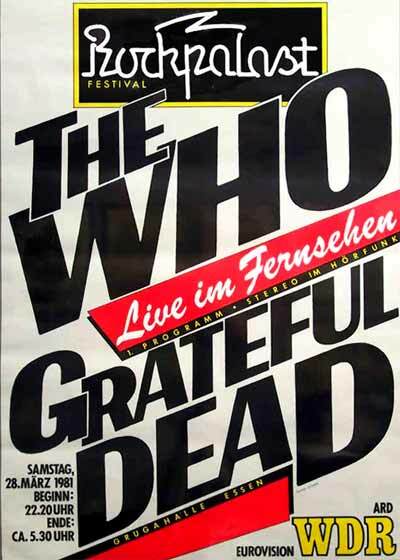 Firstly The Who churned out a good 90 minute set ,which apart from the fact that they looked so bloody old ( we all thought Daltry looked positively geriatric ) and Kenny Jones being no sort of substitute for dear old Keith Moon - was very enjoyable. Then of course there was the obligatory gap between bands to set up the stage . By then it was around 12.30 . Then the Dead played for over three hours , not including the half hour set break ! It was dawn by the time they finished . Also finished was a rather large quantity of my home brewed wine and beer as well as many brain cells from the assembled attendees, sacrificed on the altar of Bacchus. For some years this show proved invaluable as a tool to trade myself into a Dead collection , marooned as I was in Australia with no other shows apart from Make Believe Ballroom. Although many copies were in circulation , many were far less well recorded than mine and my master tempted many US traders to take the plunge and send tapes across the briny to the land of OZ. Of course the fact that most of this show is a monster also was a factor in the equation. Almost all of this show is HOT . From the opening notes of the first set song Alabama Getaway, its obvious the boys mean business. Everyone is on form , especially Jerry, who though he has aged a heap since the last visit to the Continent in 74, displays impeccable chops the entire night . The first set has energy throughout but things REALLY get going during Sugaree .Fuelled by great stabs of swirling chords from new keyboard player Brent Mydland ( well he was new to us Britheads in the live context anyway ) this just goes from strength to strength. Big close ups of Jerry on the TV also give this song a great boost. After Sugaree the audience clap along to a spirited pairing of Me and My Uncle >Mexicali Blues, with Jerry delivering a sharp succinct solo and Bobby in good voice. The sound mix is great and its obvious the video director has a knowledge of the music as he /she is on the button with shots of all the band members when they are featured in each song. The cowboy songs are fun , but so far we have only tasted the entree, now comes the meat and potatoes of the first set. A very funky Shakedown Street . The band really gets into the groove on this one , which starts off with a humongous opening chord. Throughout, Jerry is throwing in far out little punctuation's and then when he begins his first solo , he really starts to cook. Some of his high notes would cut glass. 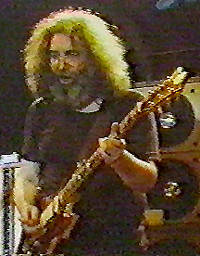 After a quieter vocal interlude where Jerry and Bobby repeat the chorus the band begin to develop a really funky jam. Jerry is vamping using some fuzz in his mix, whilst Bob chops it up underneath , Brent is also adding soulful organ fills and Phil is laying down big bass, for a few moments things quieten down and then Jerry grabs the song by the scruff of the neck and accelerates vertically for a great close . Little Red Rooster is even better. Both guitarists really get it on with their slide playing , with occasional stabs of feedback that all seem to fall in the right place and Brent develops a really jazzy solo which builds and builds until Weir drops into his spot which shows how far he has come in terms of developing his bottle neck playing . However, it has to be said that Jerry just blows him away when he enters the affray with a searing tone which is just so soulful it hurts . A short pause and then we are into the realms of Althea, which has to be one of the strongest numbers of the whole night, with Phil really making his presence felt throughout and Jerry's vocals being spot on. It builds slowly, with Jerry leading the band in a slow stately pace until the end of the vocals, when the tempo begins to build up a notch , with Jerry squeezing out razor thin notes which slice through everything. Weir then delivers a very intense Looks Like Rain , where Brent is very much to the fore, although no big jam ensues. This is remedied by Deal , the set closer, delivered at a spanking pace, where the band really pulls out all the stops and which just seems to go on forever. The second set starts up in fine style with the snappy drum intro of Samson , propelled along throughout by Jerry and Brunt's interplay ( Brent really impresses me this night, although he's hardly seen on the video itself, he's very much to the fore in the sound mix) Weir gets good and impassioned , really spitting out the verses at the start, then Jerry throws in a peppy solo which is undercut by choppy organ flurries from Master Mydland. Very nice. Another chorus and then Jerry steps up again and delivers another offering, this time a longer one , with Brent once more reprising his previous work. 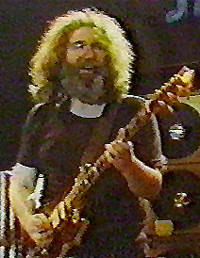 This is a pretty short Samson actually and after this Jerry decides that he's gonna deliver a slow song and take some time in doing it- nine minutes to be exact . His choice is Ship Of Fools and he sings and plays it most beautifully, with a lovely moving solo that exudes class. So far we haven't really seen many extended numbers , but for the next hour or so the band don't stop for a breather. 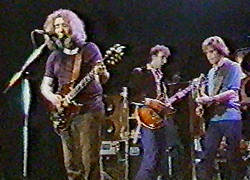 Estimated comes first, Jerry boosting the tempo with a short solo after the first verses that is piercing and intense before Weir comes back into the don't worry sequence , which then develops into a mid tempo jazzy interlude that stretches out into some goodly spaces for the next five minutes or so, this then moves with a fairly smooth transition into He's Gone , a real mellow “He's Gone” which never once drops its standard vocally or playing wise. Jerry is on form vocally in this one -as are the rest of the band-, its one of those rare occasions where they got it right during a TV broadcast. .
A long soulful nothings gonna bring him back suddenly metamorphosis's into an adrenaline fuelled Other One which is alas, all too short . Short it is , but it is HOT and a lot of serious wailing takes place during this piece as its played at a breakneck pace . Just after the tape flips, the Other One moves into a short Space, almost too short to deserve the title really, as it never really develops properly. Just as its taking off into some nice gnarley guitar gymnastics, the band decamps to the dressing rooms , with the exception of the drummers, who move into their spot. 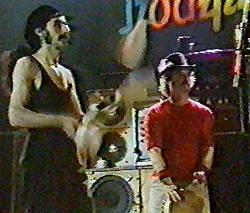 This is a very long drums and its not all that interesting to listen to at times because after a fast workout of three or four minutes on the main Beast,, the Flying Karamazov Brothers come on-stage and Mickey and Bill do some interaction with them which is fun to watch on the video but is not that great aurally. As they lay down a basic beat the Karamazov's juggle numerous Indian clubs whilst Mickey and Bill walk through unscathed with their drums ( well relatively unscathed anyway, Bill does get hit once ). Then Mickey acts as glamorous assistant and stands in the middle of the stage whilst the Brothers hurl the clubs around him, this count goes to twelve altogether and our hero emerges with nary a hair on his head touched by a Flying Karamazov club . Its also during this time that the dorky announcer on the FM broadcast interrupts to try to explain just what is going on which the radio audience can't see. This segment goes on for about 10 minutes or so, and then the boys return to the Beast and have a good thrash which clears out the cobwebs. The whole drums takes up almost half of a side of the tape and it has to be said that without the video a good part of it drags a bit. However, the climax of the drumz is meaty and when the rest of the band emerges they are accompanied by Pete Townsend and they immediately launch into a very distinctive Not Fade Away. Pete doesn't play all that much , but he does change the sound of the band significantly and he certainly gets into NFA ( which is great is fun and builds a nice head of steam ) as he is familiar with the material, however, its not quite the same thing when the band moves into Wharf Rat and Bobby has to take him upstage and show him just how to play along . Pete certainly seems to enjoy himself and Jerry is grinning some during this sequence, but given the circumstances it might have been better to play something else with Townsend aboard, its not that he buggers it up in any way, its just that he can't contribute all that much to the music . Whatever, this is a great Wharf Rat and it builds to a wondrous jam which is full of fire , before suddenly plunging into the intro to Around and Around. From here on its rockers time , where Weir does his thing and nearly throws his voice away after prolonged shouting ,during this rowdy Around and Around which leaps straight into a full on Good Lovin'' ,during which Brent again leaps to the fore with impassioned backup vocals and excellent keyboard comping . Then its over, and the crowd goes ape, with banners waving and mass chanting and cheering . After a while the band return and storm through a steamy One More Saturday Night and then it really IS over. What a great week, back to back Saturday nights with the good olde Grateful Dead at last we got a taste of what our US cousins were getting on a regular basis. Alas, that was the last I ever saw of the Dead on-stage ,but what a way to go out ! I still maintain this is one of the best post 80s Dead shows on video ever, so if you haven't got a copy go out there and get one NOW ! Phil Lesh and Brent Mydland Photogallery .